Tascosa Office Machines has been in business for ten years. Headquartered in Amarillo, we have an unparalleled track record in supporting local businesses, hospitals and schools. Tascosa believes in giving back to their communities through supporting churches and non-profit organizations every year, donating copiers, printers and fax machines. Tascosa’s Lamesa staff consists of four dedicated employees. Of these, two are manufacturer-certified technicians able to support your copier needs. 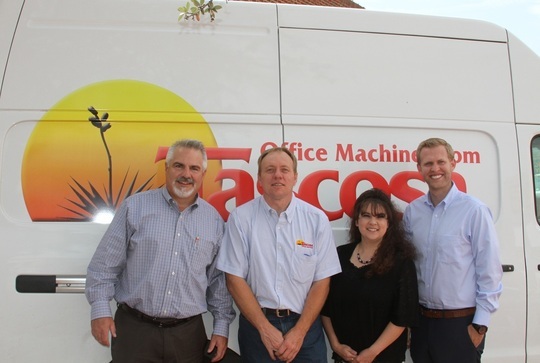 With additional administrative support in Lamesa, as well as the immediate support of the Lubbock staff, Tascosa Office Machines can guarantee that we will be able to meet all of your office needs. It gives us great pleasure to be able to show our customers a much higher quality of service, parts supply, billing expertise and decision-making combined with West Texas courtesy. We do not hide the fact that Tascosa Office Machines does not always offer the cheapest price in town. (You get what you pay for!) We are offering you the best support and equipment in terms of value, reliability and maintenance after the sale! As a member of the Lamesa Chamber of Commerce, we are enthusiastically invested in Lamesa’s economy. Our dollars are not diverted to St. Petersburg, Florida or Rochester, New York. Our dollars stay in West Texas.